I have experienced the full throttle power of prayer to change a man’s life—to strengthen a man’s resolve, to protect a man’s heart, to change a man’s cause, and to mature a man’s faith. I saw the power of prayer at home first hand with my parents. My mother, daily travailing before the Lord for her family. Today, I witness it in the life of my husband, and a host of husbands whose wives call out to God in prayer. I witness it too in my life as my husband John prays for us as his family – calling the heavens on my behalf. I know marriages are not easy. If you have been married even for just a week, you probably have something to say about marriages. Fairy tales are indeed tales. There is a lot of work that goes in any marriage, for it to be strong. And even after being that strong, there is lots of intentionality that goes in. Marriages are never devoid of occasional angry fights, weird tensions created by assumptions or presumptions of either spouse, and grotesque caricatures of self that threaten to burst the fine “WE” bubble. The truth is, most couples struggle thorough marriages. Men struggle with their nagging, critical and negative wives. Women who place themselves high on the judgement pedestal, always reminding them of their weaknesses and failures. Wives who expect too much but give little or nothing at all. Wives who are in constant comparison of their lives to others, reporting what it “ought to be.” Wives who cannot submit but compete. Wives who don’t know that their position is only a point of strength. Women struggle with husbands too. Husbands who do not live up to their expectations. Husbands who give their best to work, and feed their families on crumbs. Husbands who withdraw emotionally and still make advances sexually. Men who are aloof, passive, withdrawn, narcissistic, hardhearted, mean-spirited, and verbally abusive. Then probably you have an amazing spouse! They care, they love, loyal, faithful and stick out for you no matter the season. Thank God for them. All in all, prayer can never be put on the shelf even in a thriving marriage – it’s only thriving by the grace of the Lord. Regardless of where your man, your wife or your marriage falls on the continuum of amazing to bearable to thriving, there is always room for improvement. 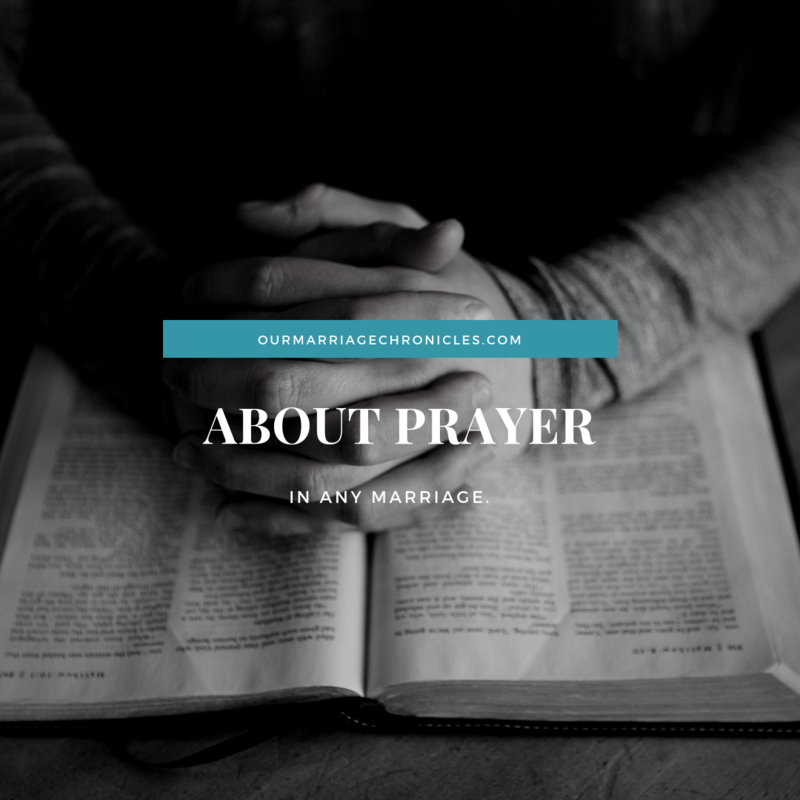 Prayer can make a really bad marriage good, and a good marriage amazingly great. Prayer is not a means of gaining control over your spouse. In fact, prayer moves control from your hands to the hands of the Lord. Prayer involves turning the finger that points out your spouse’s faults and folding it along with the others in prayer. As a wife, you have the power to open the floodgates of heaven… through prayer on your husband’s behalf. Whether your husband hasn’t yet decided to follow Christ, has a lukewarm fledgling faith, or lives a fiery firm faith, there is no one more qualified to pray for his relationship with Christ than you. As a husband, you have the power to intercede on behalf of your wife. You have the priestly anointing in your family. Yes your wife can turn around from an angry bitter wife, to one governed by the HolySpirit. Exuding the calmness and quietness of peace. No matter where your husband is on the continuum of faithlessness to faithfulness, I encourage you to pray with “the assurance of things hoped for, the conviction of things not seen”(Hebrews 11: 1). How about fighting your war(S) on your knees? Previous PostDO NOT BE AFRAID OF MARRIAGE.